A fake bank which was set up to look just like a real one has swindled Chinese savers out of 200m yuan ($32m; £21m), it's reported. To customers in the eastern city of Nanjing the interior looked like any other state-owned bank, with uniformed clerks working behind the counters, the Southern Metropolis Daily website reports. Almost 200 people deposited their cash, including a businessman who handed over 12m yuan ($1.9m; £1.3m) in 2014. But he grew suspicious when he wasn't paid the promised interest on his money, and went to the police after the bank refused to return his savings. A police investigation found that it was actually a rural cooperative, which had none of the accreditations required to operate as a bank. It had been promising interest rates of 2% per week and high interest subsidies, police say. 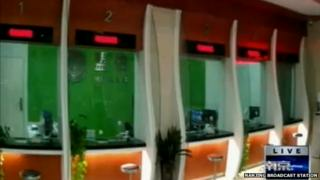 The fact the "bank" was able to operate for so long has left some Chinese social media users incredulous. "More than a year, it looks like the authorities have gone blind," says one user on the Weibo social network. "Fake banks, and a fake local government," comments another user. Police have arrested five people over the scam, including a woman who reportedly high-tailed it to Macau, China's famous gambling centre, with the customers' money.